The amenities at Geejam are upscale while maintaining organic standards. Subtle, streamlined patio furnishings, hidden speakers and lowlit walkways imbue an air of forwardthinking chic. The Day Dream canopy deck is the best spot from which to view the waterfall, featured at the center of the property. Fusing sleek design with a rootsy tropical attitude, it also offers one of the best places on the property for luxury lounging. The following amenities can be found in each guest room on the property: five hundredcount cotton sheets, hard wood floors and custommade blackout blinds, all of which add to the finely orchestrated palette of 'uberluxury' ethos. 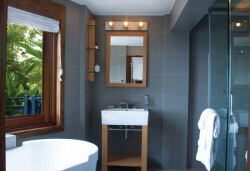 The bathrooms are highlighted by a spaquality steamroom within the shower. A compact digital surround sound system exists in each room, going by the pseudonym of George, which allows you to view Apple iTV (offering an everexpanding menu of movies to choose from), and play and charge an iPod, all in the comfort of your room. Broadband Internet wireless connection is available throughout the property, both indoors and out. Select a newspaper from over fifty international publications the night before, and you will receive same day delivery for the duration of your stay. 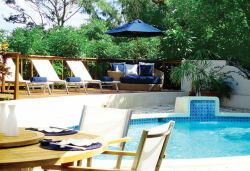 Children are welcome, but are encouraged to stay in Sanwood, the threebedroom villa, with their respective families. Nanny service is available. Complimentary car and driver for local tours and excursions. 24hour reception area is located at the Bushbar.